FLAGSTAFF —Ever wonder what it would be like to see hundreds of elk in one place at one time? 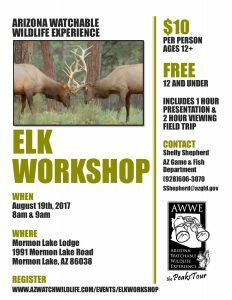 That opportunity is possible during the elk viewing workshop hosted by the Arizona Watchable Wildlife Experience (AWWE) with support from the Game and Fish Department’s WOW (World of Wonder) program and Mormon Lake Lodge. Workshop presentations are scheduled for 8 a.m. and 9 a.m. Saturday, Aug. 19. The workshop includes a presentation and a field trip to watch elk in their natural habitat near Mormon Lake. Mormon Lake is unique as it is only one of two natural lakes found in Arizona. During the early fall, hundreds of elk can be observed at the site and along Lake Mary Road. The workshop will include a minimal fee of $10 per person and kids 12 years and under are free. Presentations are starting at 8 a.m. and 9 a.m. Saturday, Aug. 19. Participants will attend a presentation, located in the Town Hall at Mormon Lake Lodge and also go on a field trip. The field trip location will be determined that day based on where the elk are observed. Spotting scopes will be provided, but participants are encouraged to bring binoculars, water, snacks and appropriate clothing. Anyone interested in registering for the workshop will need to go to the Game and Fish portal. Mormon Lake Lodge is located about 25 miles south of Flagstaff (take Lake Mary Road and turn off on Mormon Lake Road). For directions, visit www.mormonlakelodge.com.